Polymethyl Methacrylate Market « Global Market Insights, Inc. 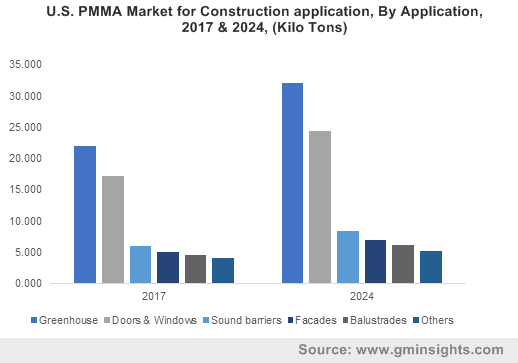 The global PMMA market for construction application has been experiencing significant growth lately, due to the increasing demand for shatterproof & weathering resistant materials as a viable replacement to glass. Numerous construction enterprises are continually looking for a suitable glass alternative to be utilized across a number of different applications that range from greenhouses, aquariums, worktops to facades and car ports, which would help augment PMMA market for construction application in the years ahead. According to the Harvard Business Review, a new survey conducted by Future Workplace revealed that even though enterprises boast of a number of employee perks, which include nap pods, treadmill desks, bring your own device, fitness centers and onsite cafeterias, a majority of employees crave something that is significantly more fundamental & essential to basic human needs as access to natural light. More than 1,614 employees who were surveyed claimed that access to natural light & an open view of the outdoors triumphs almost all of the employee perks the company gives them. The survey also discovered that the lack of natural light & an open view of the outdoors has a sizable detrimental effect on employee experience. Over a third of the surveyed employees feel that they don’t get enough exposure to natural light inside their workplace with 47% of the employees admitting to feeling moderately to acutely fatigued due to the lack of natural light in their respective offices. More than 43% claimed that they felt gloomy due to the absence of natural lighting. With a growing importance being given to employee comfort and wellbeing in recent years, the global PMMA market for construction applications would be witnessing a surge in business demands on account of a number of enterprises attempting to improve the company’s employee experience by constructing, renting or modifying existing work premises to incorporate more natural light into the building. The fact that this trend also helps enterprises save significant amounts on their electricity bills will further help propel the growth prospects of the PMMA market for construction application in the forthcoming years. The modern European construction industry is increasingly adopting plastics in their practices to make construction activities and the building structures more affordable & energy efficient. The accelerated adoption of plastics and the incorporation of new plastic technologies are expected to majorly upscale the demand for PMMA in the continent’s construction segment, which incidentally is one of the largest employers in the European Union. According to PlasticsEurope, Europe’s construction & building sector accounts for more than 19.7% of the approximately 49 million tons of plastics annually consumed across Europe, which is one in every five tons. With the demand for plastics on a continually escalating graph, Europe PMMA market for construction application is anticipated to record immeasurable growth in the ensuing years. Among the regional grounds, Germany, especially, is slated to establish itself as a prominent marketplace for Europe owing to the extensive utilization of PMMA in the construction of carports. The material’s shatterproof & durability properties make it an ideal raw material in the construction of the said carports, which are witnessing increasing demands owing to the growing vehicle sales across the country. This would consequently help augment the commercialization portfolio of the Germany PMMA industry for construction application, that is slated to cross $125 million by 2024. It is rather vivid that owing to the emerging trends in the construction industry, the global PMMA market for construction application would be experiencing sizable growth over the forthcoming time period. In fact, a Global Market Insights, Inc., report projects that the overall PMMA market size for construction application is expected to surpass the $3 billion renumeration mark by 2024. This entry was posted in Polymers and Advanced Materials and tagged Blocks PMMA Market, Canada PMMA Market, Cell Cast Sheets PMMA Market, Construction PMMA Market, Europe PMMA Market, Extruded PMMA Market, PMMA Market 2019 for construction, PMMA Market 2025, PMMA Market For Construction Application, PMMA Market size For Construction Application, PMMA Market statistics, Polymethyl Methacrylate Market, U.S. PMMA Market.